Three rockets fired by Gaza-based terrorists hit open regions in the Eshkol Regional Council, causing no injuries or damages. 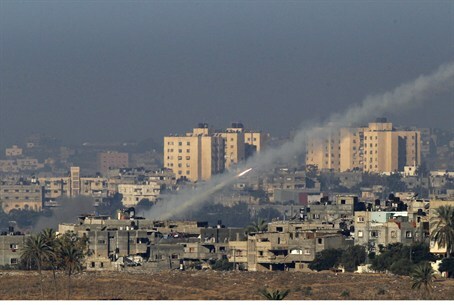 Three rockets fired by Gaza-based terrorists exploded late Monday night in the Eshkol Regional Council. The latest attack came several hours after many residents of the resort city of Eilat called police saying they had heard two loud explosions. The explosions occurred at about 7:00 p.m. local time. Police and IDF soldiers started combing the city, and a security source told the AFP news agency that at least one rocket struck the outskirts of the city. "At least one rocket was fired at Eilat and they found the remains on the outskirts of the city," he said, speaking on condition of anonymity, adding the searches were continuing. Neither the police nor the army could confirm rocket fire on the city and the searches are expected to continue on Tuesday morning. Rocket attacks from Gaza have increased in recent days and the Israeli Air Force (IAF) has been retaliating with airstrikes on terrorism sites in the Hamas-controlled region. On Saturday night, IAF aircraft targeted several terrorist sites in Gaza after a rocket exploded in an open area between two communities in the Sha'ar Hanegev Regional Council. There were no physical injuries or damages in the rocket attack. Defense Minister Moshe Ya'alon warned Gaza terrorists on Sunday that the IDF would hit hard and fast against terror targets each time Israel was attacked. “The IDF on Sunday morning targeted a terror cell that was responsible for firing rockets at Israel last week, when rockets were fired at Ashkelon,” Ya'alon said. “We will not accept the targeting by terrorists of Israel, and we will act to cause damage to anyone that threatens the security of our citizens,” he added.